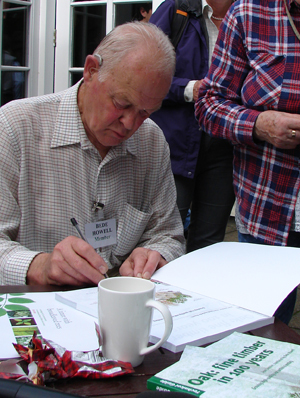 Bede Howell is a massively respected forest manager (and French speaker) who has always taken the long view of British woodlands. In this new book, Bede both learns from the experience of others and shares it - he has translated into English Jean Lemaire's brilliant book on growing oak for timber. 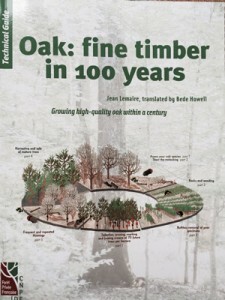 Oak trees are easily the most important broadleaves in Britain and occupy about 9% of the forest area but typically rotations have taken 150 - 200 years or more to maturity but with wise planting and management this book, "Oak: fine timber in 100 years", shows how good quality timber can be grown in about 100 years. "Oak: fine timber in 100 years" uses every possible way of getting its message across - text, photos, diagrams, charts, graphs, tables, maps and sketches. The Lemaire/Howell gospel is that you should manage your oak trees scientifically and you need to understand which oaks to grow where and to use the best methods of establishment for the particular site, whether that's by natural regeneration, planting or direct seeding with acorns. It then moves on to thinning and pruning where the key is to have the right density and to select "winners" (the final crop) fairly early on. Useful hints are given about avoiding "epicormic growth", being the shoots that come out of the sides of the trunks and spoil final sawlogs, and it offers detailed advice on pruning - which trees, why, when and how. Oak is now very much back in fashion as a tree to grow - in the 1970s everyone wanted to plant conifers which were promoted furiously in the UK both by the grant system and the prevailing wisdom. But even when oak started to come back onto the forester's agenda in the 1980s almost no one distinguished between pedunculate and sessile oak let alone considered which soils and sites were best for each. For me, the heart of the book is pages 18/19 where the best locations for planting each type of oak are set out: sessile grows best in mild and more oceanic climates and so is less predominant in northern and eastern Europe but it can flourish at higher altitudes than pedunculate. Sessile Oak has less need for water and tolerates drier sites including plateaux, small hills and mountainous sites, where it mixes with beech. By contract pedunculate oak is essentially a valley bottom tree and does well on deep, rich soils with plenty of moisture and it needs full light and does not do well in the dense stands often used for sessile oak. Productivity of both types of oak is increased with frequent thinning to achieve a large crown and to maintain a fast, even growth. Also strongly recommended is active management of the coppice understorey which improves water availability for the oak trees but also limits the risks of epicormic growth. As Roger Venables says in the preface to the book, "the French have a magical way with oak that has been the envy of British and Irish land owners and foresters for generations." He points out that Jean Lemaire's work is the result of 30 years of research which demonstrated that oak can be grown on a much shorter rotation than was previously the practice. Lemaire is rather like a real life version of the "Man who planted trees". In that fictional book by Jean Giono; a humble individual gives his life to planting trees in a way that will transform the countryside for the better - in his work Jean Lemaire has a similar objective and also without great status - Lemaire is the "technical secretary for the working group join oak for the IDF (Institute for Forestry Development). At £30, the book is a bargain for anyone who is serious about growing oak. For those who are comforted by such matters, the cover price will not pay the full cost of production as shown by the fact that it was sponsored by several organisations including Future Trees and Woodland Heritage. I shall print this article out as the book is probably too much for a non-woodlander such as me, but the information here will be added to my knowledge base for reference. Thank you Angus. Growing Mushrooms on Logs in your Woodland.